Container Collective is in the business of bikes, yoga, and community. 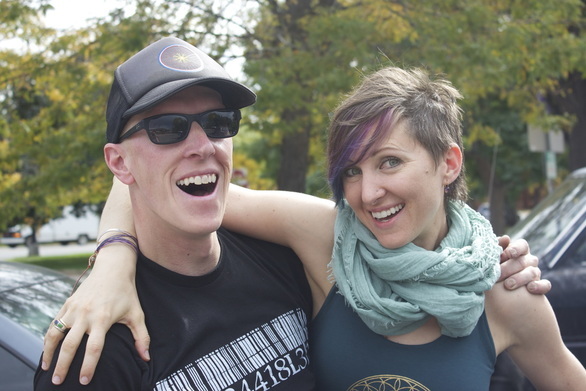 Owners Brittany and Russ Hopkins each bring their personal talent to a specific corner of the business, Brittany to the yoga side and Russ to the art and architecture of bikes – bamboos bikes specifically and even more specifically, building them from scratch in his 2-day workshops. The bamboo bikes definitely qualify as functional art. They are sleek and minimalist, but also have an industrial raw look to them, the combination of bamboo, metal gears, and the black carbon fiber thread that wraps the joints. In speaking with Russ I can see his passion, not just for bikes, but even more for the process of teaching someone to build something from scratch. He tells me that he’s really in the business of helping people to realize that they have the skills, the talent, the tenacity to construct something from the ground up. Russ learned the process while living and teaching in Beijing, but when he and Brittany realized that their hearts still lay in Colorado, he brought the concept here. 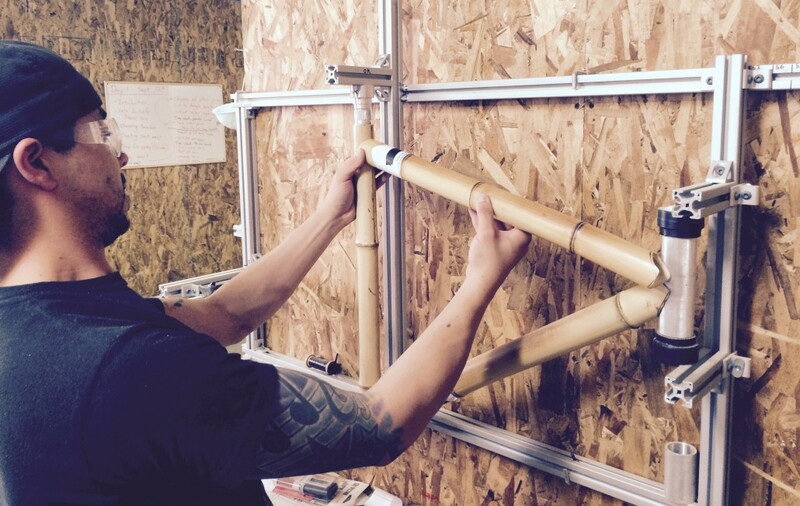 The workshops are designed with beginners in mind and Russ stresses that building a bamboo bike is simple, and requires no previous knowledge about materials or tools. 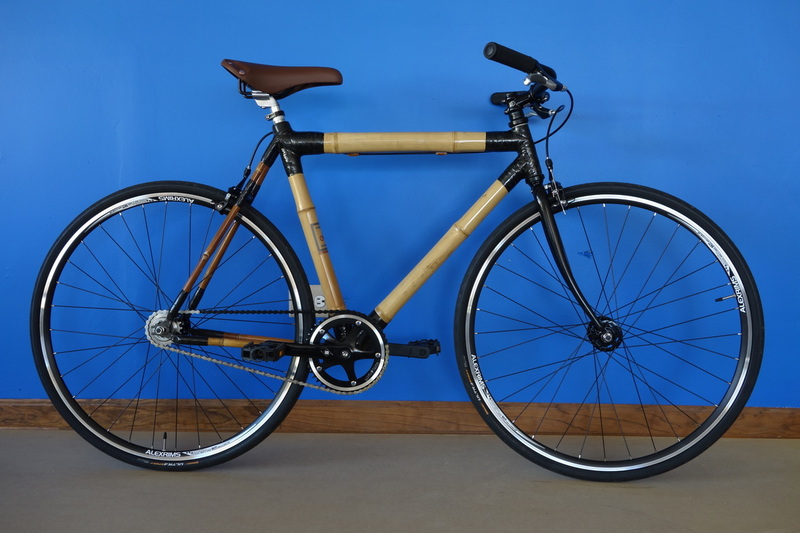 One of my biggest concerns about bamboo bikes is their ability to stand up to the Colorado elements. Russ assures me that with the same level of care and love that you’d commit to any bike in Colorado (bamboo or otherwise), the bikes should last for a very long time. He tells me that the workshop utilizes several different applications, including coating the bike in epoxy, to make the frame durable. Additionally Container Collective has a lifetime warranty on each bike. If something breaks they’ll fix it for free, or allow you to build a new frame at cost. I’m all in for anything that lets you get your hands dirty and walk away with something that will make heads stop and turn, even in a city like Lakewood/Denver. Check out cc360denver.com for more details. Workshops generally run every other weekend and pricing depends on the type of bike. Artist and graphic designer Justin Deister tells us more about his piece Mr Caribou, which is featured in our upcoming exhibit Black, White, and Metal. Learn more about his work below and head to the bottom of this post for detailed information about our upcoming show. 1. Why the name, Mr Caribou? The name refers to the Caribou Ranch near Nederland, the barn was converted to a recording studio in the early 70’s. Many musicians made great music there including Joe Walsh, Elton John and Chicago. It lies in an absolutely peaceful valley. Not realizing what it was, my wife and I recently discovered it for ourselves when we were out hiking and took refuge there from a sudden rainstorm. I named the piece Mr Caribou in its honor. 2. What was your inspiration for the piece? My inspiration and process are intertwined so closely that there is no discernible difference. I am a graphic designer and I love the design of all things so I collect the stuff of our culture – water faucets to watches, cameras, gears and bank vault doors, springs and burned out toasters. I have a vague inventory in my head of a lot of junk I collect and pull out hundreds of items for each piece and kind of stir them around until they arrive. Mr Caribou is a collection of music related items, all of which suggests musical arts and vaguely creates something that is more than the sum of its parts. Nothing is laid out in my head. It all takes place as I see it and a story begins to present itself. I allow myself to be open minded and go with the flow. 3. 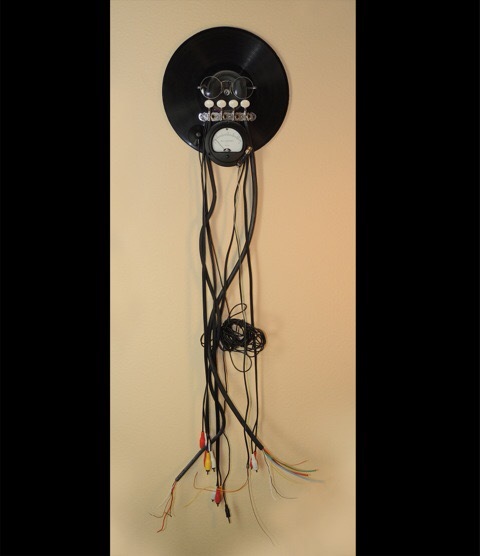 This piece has a lot of (arguably) outdated technology in it – record, old fraying AV cords – is there anything behind this or is it more about finding materials that have the look and feel that you are going for? Sometimes materials are closely related while other pieces stretch thematic relationships. I have no problem using an exhaust fan, water sprinkler, fuel gauge and swimming goggles together. It’s more about an overall impression. A story that I present might intentionally include pieces that don’t suit the content but provide the desired form, or the reverse. Mystery is more fun, and in the ambiguous and subjective there is meaningful self-discovery – that’s what I want. 4. Finally, it seems like the glasses add a bit of humor to this piece? Is that something you try to do in your work? A lot of my work has a humorous element, or is at least generally uplifting. However, I retain the purposefully subjective because I like to allow the viewer to decide how to interpret and create their own story. In this case, the glasses reinforce the human aspect, help describe the era and hint at the character of a musician that the viewer has a memory of, and will make it their own. 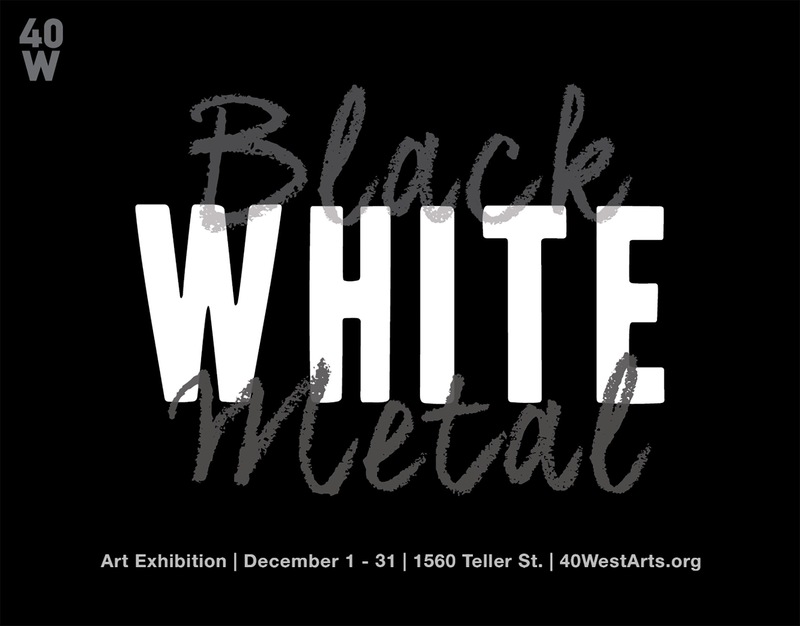 Join us December 1-31, 2015 for our Black, White & Metal exhibition, celebrating the black and white, the primal, the monochromatic palette.